The history of pizza begins in antiquity, when various ancient cultures produced basic flatbreads with several toppings. The word pizza was first documented in 997 A.D. in Gaeta and successively in different parts of Central and Southern Italy. Pizza was mainly eaten in Italy and by emigrants from there. This changed after World War II, when Allied troops stationed in Italy came to enjoy pizza along with other Italian foods. Foods similar to pizza have been made since the neolithic age. Records of people adding other ingredients to bread to make it more flavorful can be found throughout ancient history. In Sardinia, French and Italian archaeologists have found bread baked over 7,000 years ago. According to Professor Philippe Marinval, the local islanders leavened this bread. In the 6th century BC, the soldiers in the armies of the ancient Persian King, Darius I baked flatbreads with cheese and dates on top of their battle shields. The Ancient Greeks made a flat bread called plakous (πλακοῦς, gen. πλακοῦντος—plakountos) which was flavored with toppings like herbs, onion, cheese and garlic. An early reference to a pizza-like food occurs in the Aeneid (ca. 19 BC), when Celaeno, queen of the Harpies, foretells that the Trojans would not find peace until they are forced by hunger to eat their tables (Book III). In Book VII, Aeneas and his men are served a meal that includes round cakes (like pita bread) topped with cooked vegetables. When they eat the bread, they realize that these are the "tables" prophesied by Celaeno. Some commentators have suggested that the origins of modern pizza can be traced to pizzarelle, which were kosher for Passover cookies eaten by Roman Jews after returning from the synagogue on that holiday, though some also trace its origins to other Italian paschal breads. Abba Eban has suggested that modern pizza "was first made more than 2000 years ago when Roman soldiers added cheese and olive oil to matzah". Other examples of flatbreads that survive to this day from the ancient Mediterranean world are focaccia (which may date back as far as the ancient Etruscans); Manakish in Lebanon, coca (which has sweet and savory varieties) from Catalonia; Valencia and the Balearic Islands; the Greek Pita; Lepinja in the Balkans; or Piadina in the Romagna part of Emilia-Romagna in Italy. Foods similar to flatbreads in other parts of the world include Chinese bing (a wheat flour-based Chinese food with a flattened or disk-like shape); the Indian paratha (in which fat is incorporated); the Central and South Asian naan (leavened) and roti (unleavened); the Sardinian carasau, spianata, guttiau, pistoccu; and Finnish rieska. Also worth noting is that throughout Europe there are many similar pies based on the idea of covering flat pastry with cheese, meat, vegetables and seasoning such as the Alsatian flammkuchen, German zwiebelkuchen, and French quiche. In 16th-century Naples, a galette flatbread was referred to as a pizza. Known as the dish for poor people, it was sold in the street and was not considered a kitchen recipe for a long time. This was later replaced by oil, tomatoes (after Europeans came into contact with the Americas) or fish. In 1843, Alexandre Dumas, père, described the diversity of pizza toppings. An often recounted story holds that on June 11, 1889, to honour the Queen consort of Italy, Margherita of Savoy, the Neapolitan pizzamaker Raffaele Esposito created the "Pizza Margherita", a pizza garnished with tomatoes, mozzarella, and basil, to represent the national colours of Italy as on the Italian flag. However, by 1927, Ada Boni's collection of regional cooking includes a recipe using tomatoes and mozzarella. The innovation that led to flat bread pizza was the use of tomato as a topping. For some time after the tomato was brought to Europe from the Americas in the 16th century, it was believed by many Europeans to be poisonous, as some other fruits of the Solanaceae (nightshade) family are. However, by the late 18th century, it was common for the poor of the area around Naples to add tomato to their yeast-based flat bread, and so the pizza began. The dish gained popularity, and soon pizza became a tourist attraction as visitors to Naples ventured into the poorer areas of the city to try the local specialty. 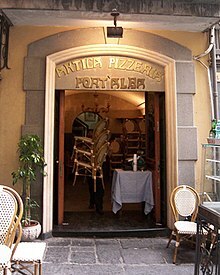 According to documents founded by historian Antonio Mattozzi in State Archive of Naples, in 1807 already 54 pizzerias existed, with their owners and addresses. In the second half of the nineteenth century they increased to 120. In Naples, two others figures connected to the trade existed — the pizza hawker (pizzaiuolo ambulante ), who sold pizza, but he did not make it, and the seller of pizza "a oggi a otto", who made pizzas, but sold them in return for a payment for seven days. Purists, like the famous pizzeria "Da Michele" in Via C. Sersale, consider there to be only two true pizzas — the marinara and the margherita — and that is all they serve. These two "pure" pizzas are the ones preferred by many Italians today. The marinara is the older of the two and has a topping of tomato, oregano, garlic, and extra virgin olive oil. It is named “marinara”, because it was traditionally the food prepared by "la marinara", the seaman's wife, for her seafaring husband when he returned from fishing trips in the Bay of Naples. The margherita is topped with modest amounts of tomato sauce, mozzarella cheese and fresh basil. It is widely attributed to baker Raffaele Esposito, who worked at "Pizzeria di Pietro", established in 1880. Though recent research casts doubt on this legend, the tale holds that, in 1889, he baked three different pizzas for the visit of King Umberto I and Queen Margherita of Savoy. The Queen's favorite was a pizza evoking the colors of the Italian flag — green (basil leaves), white (mozzarella), and red (tomatoes). According to the tale, this combination was named Pizza Margherita in her honor. Although those were the most preferred, today there are many variations of pizzas. "Associazione Verace Pizza Napoletana" ("True Neapolitan Pizza Association"), which was founded in 1984, has set the very specific rules that must be followed for an authentic Neapolitan pizza. These include that the pizza must be baked in a wood-fired, domed oven; that the base must be hand-kneaded and must not be rolled with a pin or prepared by any mechanical means (i pizzaioli — the pizza makers — make the pizza by rolling it with their fingers) and that the pizza must not exceed 35 centimetres in diameter or be more than one-third of a centimetre thick at the centre. The association also selects pizzerias all around the world to produce and spread the verace pizza napoletana philosophy and method. There are many famous pizzerias in Naples where these traditional pizzas can be found such as Da Michele, Port'Alba, Brandi, Di Matteo, Sorbillo, Trianon, and Umberto. Most of them are in the ancient historical centre of Naples. These pizzerias will go even further than the specified rules by, for example, using only San Marzano tomatoes grown on the slopes of Mount Vesuvius and drizzling the olive oil and adding tomato topping in only a clockwise direction. The pizza bases in Naples are soft and pliable. In Rome they prefer a thin and crispy base. Another popular form of pizza in Italy is "pizza al taglio", which is pizza baked in rectangular trays with a wide variety of toppings and sold by weight. In 1962, the "Hawaiian" pizza, a pizza topped with pineapple and ham, was invented in Canada by restaurateur Sam Panopoulis at the Satellite Restaurant in Chatham, Ontario. In December 2009, the pizza napoletana was granted Protected Designation of Origin (PDO) status by the European Union. In 2012, the world's largest pizza was made in Rome and it was measured to be 1261.65 square metres in area. In 2016, robotics company BeeHex, widely covered in the media, was building robots that 3D-printed pizza. In December 2017, the pizza napoletana was inscribed on the UNESCO Intangible Cultural Heritage Lists. Canada was first introduced to pizza in the late 1950s, with the first pizza ovens entering the country. It gained popularity throughout the 1960s, with many pizzerias and restaurants opening across the country. Pizza was mostly served in restaurants and small pizzerias. Most pizza restaurants across Canada also serve popular Italian cuisine in addition to pizza, such as pasta, salad, soups and sandwiches. Fast-food pizza chains also provide other side options for customers to choose from, in addition to ordering pizza, including chicken wings, fries and poutine, salad, and calzones. Pizza Pops are a Canadian calzone-type snack introduced in the 1960s. Pizza chains across Canada can be found in shopping centres, schools, and neighbourhood plazas, with the majority of these chains offering a sit-and-dine facility for customers. The most distinct pizza in Canada is the "Canadian" pizza. A "Canadian" pizza is usually prepared with tomato sauce, mozzarella cheese, mushrooms and bacon. Many variations of this pizza exist, but the two standout ingredients that make this pizza distinctly Canadian are bacon and mushrooms. Pizzas in Canada are almost never served with "Canadian bacon", or back bacon as it's referred to in Canada. Rather, side bacon is the standard pork topping on pizza. In Canada, pizza is served on a variety of crust types, including a traditional-style pan crust, a thin crust, multi-grain crust, whole-grain crust, and a gluten-free crust. Stuffed-crust pizza is also a popular pizza alternative for Canadian customers. It contains pizza toppings of the customer’s choice on a mozzarella-filled crust. Some of Canada's successful pizza brands include: Boston Pizza, Pizza Pizza, and Vanelli’s. Boston Pizza, also known as BP’s in Canada, and "Boston's—the Gourmet Pizza" in the United States and Mexico, is one of Canada’s largest franchising restaurants. The brand has opened over 325 locations across Canada and 50 locations in Mexico and the US. The first Boston Pizza location was opened in Edmonton, Alberta, in 1964, and operated under the name "Boston Pizza & Spaghetti House", with locations still opening across the nation. It is the first Canadian restaurant to introduce the heart-shaped pizza on Valentine’s Day, a 22-year tradition, where a dollar from each pizza ordered supports Boston Pizza Foundation Future Prospects. Pizza Pizza, and its subsidiary chain Pizza 73 in Western Canada, are among Canada’s largest domestic brands based in Ontario. To date, they have over 500 locations nationwide, and fill more than 29 million orders annually. Vanelli’s is an international pizza chain that is based in Mississauga, Ontario. The chain first opened in 1981, serving both pizza and other fresh Italian cuisine, such as pasta and Italian sandwiches. In 1995, the brand opened its first international location in Bahrain and became an international success. The brand continued to open additional locations across the Middle East, with chains now opened in the United Arab Emirates, Lebanon, and Morocco. There are over 110 locations worldwide; making Vanelli’s the first pizza brand in Canada to open locations internationally. Hot Dog Stuffed Crust Pizza: an angus beef hot dog, placed inside a stuffed crust, served in a medium or large pizza, with toppings of the customer’s choice. Grilled Chicken Club: a spin on Canada's popular sandwich that is served with an alfredo sauce, grilled chicken strips, bacon, diced tomatoes, lettuce, mozzarella cheese and a pepper mayo sauce. Smokey Maple Bacon Pizza: a pizza served with Alfredo sauce, maple bacon strips, bacon crumble, sliced mushrooms, shredded cheddar and mozzarella cheese. Pizza first made its appearance in the United States with the arrival of Italian immigrants in the late 19th century and was popular among large Italian populations in New York City, Chicago, Philadelphia, Trenton and Saint Louis. In the late 19th century, pizza was introduced by peddlers who walked up and down the streets with a metal washtub of pizzas on their heads, selling their pizzas at two cents a slice. It was not long until small cafes and groceries began offering pizzas to their Italian American communities. The first printed reference to "pizza" served in the US is a 1904 article in The Boston Journal. titled "Dear slice: Boston may have had the first pizza in America." Giovanni and Gennero Bruno came to America from Naples, Italy in 1903 and introduced the Neapolitan pizza to Boston. Later, Vincent Bruno (Giovanni's son) went on to open the first pizzeria in Chicago. Conflicting stories have the first pizzeria opening in 1905 when Gennero Lombardi applied for a license in New York to make and sell pizza. One of the generally accepted first US business to sell pizza, Lombardi's, opened in 1897 as a grocery store at 53½ Spring Street, with tomato pies wrapped in paper and tied with a string at lunchtime to workers from the area's factories. In 1905, putative founder Gennaro Lombardi received a business license to operate a pizzeria restaurant, and soon had a clientele that included Italian tenor Enrico Caruso. He later passed the business on to his son, George. While the original Lombardi's closed its doors in 1984, it was reopened in 1994 just down the street and is run by Lombardi's grandson. In 2019, suspicion was raised whether Lombardi was the business' true founder, after a search of his birth record, naturalization papers, and other supporting documents show he first came to America in November 1904 at age 17, classified as a “laborer”. If he became involved with the pizzeria at 53 1/2 Spring Street in 1905, it was as an employee not as an owner. Research suggests Filippo Milone opened the pizzeria. Pizza was brought to the Trenton area of New Jersey with Joe's Tomato Pies opening in 1910, followed soon by Papa's Tomato Pies in 1912. In 1936, De Lorenzo's Tomato Pies was opened. While Joe's Tomato Pies has closed, both Papa's and Delorenzo's have been run by the same families since their openings and remain among the most popular pizzas in the area. Frank Pepe Pizzeria Napoletana in New Haven, Connecticut, was another early pizzeria which opened in 1925 (after the owner served pies from local carts and bakeries for 20–25 years) and is famous for its New Haven–style Clam Pie. Frank Pepe's nephew Sal Consiglio opened a competing store, Sally's Apizza, on the other end of the block, in 1938. Both establishments are still run by descendants of the original family. When Sal died, over 2,000 people attended his wake, and The New York Times ran a half-page memoriam. The D'Amore family introduced pizza to Los Angeles in 1939. Before the 1940s, pizza consumption was limited mostly to Italian immigrants and their descendants. Following World War II, veterans returning from the Italian Campaign, who were introduced to Italy's native cuisine proved a ready market for pizza in particular, touted by "veterans ranging from the lowliest private to Dwight D. Eisenhower". By the 1960s, it was popular enough to be featured in an episode of Popeye the Sailor. Pizza consumption has exploded in the U.S. Pizza chains such as Domino's, Pizza Hut, and Papa John's. Two entrepreneurs, Ike Sewell and Ric Riccardo, invented Chicago-style deep-dish pizza, in 1943. They opened their own restaurant on the corner of Wabash and Ohio, Pizzeria Uno. Pizza chains sprang up with pizza's popularity rising. Leading early pizza chains were Shakey's Pizza, founded in 1954 in Sacramento, California; Pizza Hut, founded in 1958 in Wichita, Kansas; and Josey's Pizza, founded in Newnan, Georgia, in 1943. Later restaurant chains in the dine-in pizza market were Bertucci's, Happy Joe's, Monical's Pizza, California Pizza Kitchen, Godfather's Pizza, and Round Table Pizza, as well as Domino's, Pizza Hut, and Papa John's. Pizzas from take and bake pizzerias, and chilled or frozen pizzas from supermarkets make pizza readily available nationwide. 13% of the US population consumes pizza on any given day. ^ Anderson, Burtan (1994). Treasures of the Italian Table. William Morrow and Company. p. 318. ISBN 978-0688115579. ^ Crompton, Dan (2016). A Classical Primer: Ancient Knowledge for Modern Minds. Michael O'Mara. ISBN 1782435115. ^ "Aeneas and Trojans fulfill Anchises' prophecy". Archived from the original on March 29, 2017. Retrieved May 11, 2017. ^ Nissan, Ephraim; Alinei, Mario (2013). "The Pizza and the Pitta: The Thing and Its Names, Antecedents and Relatives, Ushering Into Globalization". In Felecan, Oliviu; Bughesiu, Alina. Onomastics in Contemporary Public Space. Cambridge Scholars Publishing. ISBN 1443852171. ^ Bamberger, David; Eban, Abba Solomon (1979). My People: Abba Eban's History of the Jews, Volume 2. Behrman House. p. 228. ISBN 0874412803. ^ "Food and Drink – Pide – HiTiT Turkey guide". Hitit.co.uk. Retrieved June 5, 2009. ^ "History of Pizza Margherita". tobetravelagent.com. April 9, 2012. Retrieved April 9, 2012. ^ Dumas, Alexandre (1843). Le Corricolo (Oeuvres Complètes (1851) ed.). p. 91. Retrieved May 22, 2012. ^ Danford, Natalie (October 1994). "Beyond Pizza". Vegetarian Times. Active Interest Media (109). ISSN 0164-8497. ^ "Rallying to protect 'real' pizza". Philadelphia Inquirer. April 5, 1989. ^ "Pizza purists out to protect patriotic pie". Lakeland Ledger. Associated Press. March 2, 1989. ^ Alexandra Grigorieva, "Naming Authenticity and Regional Italian Cuisine ," in Richard Hosking, ed., Authenticity in the Kitchen: Proceedings of the Oxford Symposium on Food and Cookery 2005 (Prospect Books, 2006): 211–216. ^ Grigorieva, Naming Authenticity," p. 211-212. ^ "Was margherita pizza really named after Italy's queen?". BBC Food. December 28, 2012. Retrieved December 31, 2012. ^ "American Pie". American Heritage. April–May 2006. Archived from the original on July 12, 2009. Retrieved July 4, 2009. Cheese, the crowning ingredient, was not added until 1889, when the Royal Palace commissioned the Neapolitan pizzaiolo Raffaele Esposito to create a pizza in honor of the visiting Queen Margherita. Of the three contenders he created, the Queen strongly preferred a pie swathed in the colors of the Italian flag — red (tomato), green (basil), and white (mozzarella). ^ "Avpn – Associazione Verace Pizza Napoletana". Pizzanapoletana.org. Retrieved June 5, 2009. ^ Nosowitz, Dan (November 4, 2015). "Meet the 81-Year-Old Greek-Canadian Inventor of the Hawaiian Pizza". Atlas Obscura. Unknown. Retrieved February 28, 2017. ^ Hooper, John (December 9, 2009). "Pizza napoletana awarded special status by EU". The Guardian. London. Retrieved December 9, 2009. ^ "Largest pizza". Guinness World Records. Retrieved January 13, 2017. From the given area, the circular pizza had a diameter of approximately 40.08 m, or 131.5 ft.
^ "NASA wants astronauts to have 3D printed pizza, and this startup is building a printer to make it happen". Digital Trends. Retrieved January 16, 2017. ^ "Naples' pizza twirling wins Unesco 'intangible' status". The Guardian. London. December 7, 2017. Retrieved December 7, 2017. ^ "Bringing the first pizza ovens to Canada in the 1950s". Canada.com. Archived from the original on March 18, 2016. Retrieved February 20, 2014. ^ a b "Boston Pizza Company History" (PDF). bostonpizza.com. Archived from the original (PDF) on February 4, 2016. Retrieved February 20, 2014. ^ "Boston Pizza Once Again Offering Heart Shaped Pizza For Valentine's Day". leaderoist,cin.com. Retrieved February 20, 2014. ^ "Hungry? Want Pizza? There's an app to help you order one". techvibes.com. Archived from the original on March 9, 2016. Retrieved February 20, 2014. ^ a b "lAbout Us Us". vanellisrestaurant.com. Retrieved February 20, 2014. ^ "locations". vanellisrestaurant.com. Retrieved February 20, 2014. ^ a b c "New Pizza Hut Pizzas". huffingtonpost.ca. Retrieved February 20, 2014. ^ Helstosky, Carol (2008). Pizza: A Global History. Reaktion Books. p. 48. ISBN 978-1-86189-630-8. ^ Kuban, Adam (January 5, 2009). "Dear Slice: Boston May Have Had the First Pizza in America". Dear Slice (blog). Serious Eats. Retrieved July 17, 2010. ^ Nevius, Michelle; Nevius, James (2009). Inside the Apple: A Streetwise History of New York City. New York: Free Press. pp. 194–95. ISBN 141658997X. ^ Bruns, Kendall (February 5, 2019). "Lost Forefathers of Pizza in America Discovered". US Pizza Museum. Archived from the original on February 6, 2019. Retrieved February 9, 2019. ^ Gennaro Lombardi documents at Regas, Peter W. (February 5, 2019). "Who was Gennaro Lombardi?". PizzaHistoryBook.com. Archived from the original on February 10, 2019. ^ Turim, Gayle. "A Slice of History: Pizza Through the Ages". History.com. Retrieved November 9, 2014. ^ Miller, Hanna (2006). "American Pie". American Heritage Foundation. Retrieved January 22, 2019. ^ "Pizza Garden: Italy, the Home of Pizza". CUIP Chicago Public Schools – University of Chicago Internet Project. Archived from the original on October 19, 2013. Retrieved August 1, 2014. ^ "CBC Archives: New 50's Food – Pizza! 1957". YouTube. September 17, 2008. Retrieved August 10, 2013. ^ Rhodes, Donna G.; Adler, Meghan E.; Clemens, John C.; LaComb, Randy P.; Moshfegh, Alanna J. "Consumption of Pizza" (PDF). Food Surveys Research Group. Retrieved September 25, 2014. Dickie, John (2010). Delizia: The Epic History of the Italians and Their Food. New York: Free Press. Helstosky, Carol (2008). Pizza: A Global History. London: Berg.